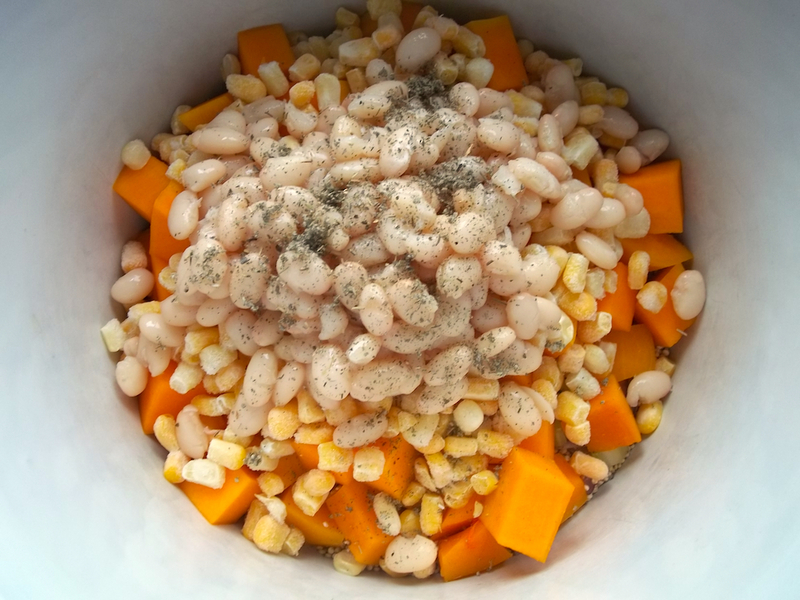 With plenty of savoury flavour and the convenience of the crock pot, finally, here is an appealing succotash recipe that makes me grateful and glad! Skeptics like me need some convincing that succotash is a dish worth serving. Though I would like to be as thankful as the my immigrant ancestors were for basic sustenance, bland food does not incline me toward celebration. My opinion about succotash changed after one bite of this new, improved version. Salt, onion, herbs and the lovely texture of quinoa round out this succotash and make it an appealing side dish worth repeating. The blend of savoury herbs and the fluffy texture reminds me of my favourite part of the Thanksgiving feast–stuffing! I am so glad I tried cooking quinoa in the slow cooker (inspired by a Mexican quinoa recipe I found). Especially now, when we have two stove top burners out of commission, additional cooking tools are especially handy. And it works wonderfully in a rice cooker too! So whether for Thanksgiving, assorted potlucks, or future holiday gatherings, from now on, succulent succotash has earned its place in my side dish repertoire. 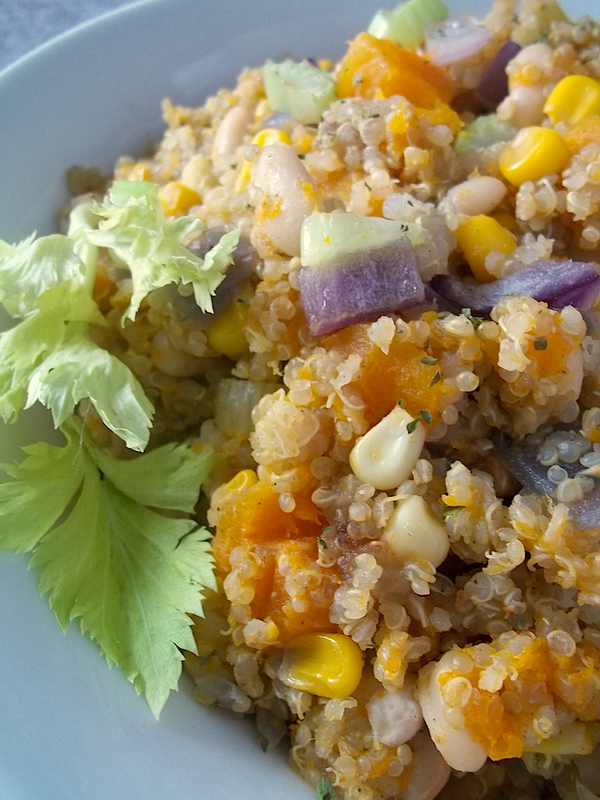 Layer the ingredients in the following order: quinoa, 1/4 cup onions, 1/4 cup celery, corn, beans, sage, broth. Cook for 3 hours on high, or until quinoa is tender and fluffy. In a small skillet or pan, heat butter or oil over medium heat and sauté remaining onion and celery, along with the rosemary. Add these to the squash and quinoa mixture. Gently stir the layers together, adding salt to taste. Keep warm until serving time. Rice cooker option: Follow the same steps as above, except add another 1/4 cup of water; use the “cook” setting on your rice cooker. The time required will only be about 40 minutes (until the rice cooker switches itself to the “warm” setting). Keep warm until ready to serve; if necessary, add a small amount of water to keep the dish moist throughout. *Note: To prepare butternut squash, I find it works well to submerge the whole squash (even part way is fine) in a pot of just-boiled hot water for 10 minutes. This softens the skin enough to peel easily with a normal vegetable peeler. After chopping off the ends, I cut the squash in half, peel the skin, and then cut it into cubes prior to cooking. This recipe will be shared at Allergy Free Wednesdays, Natural Family Friday, Savoring Saturdays, and more. I’m loving all the creative stuffing recipes that exist these days and this will be added to my list! 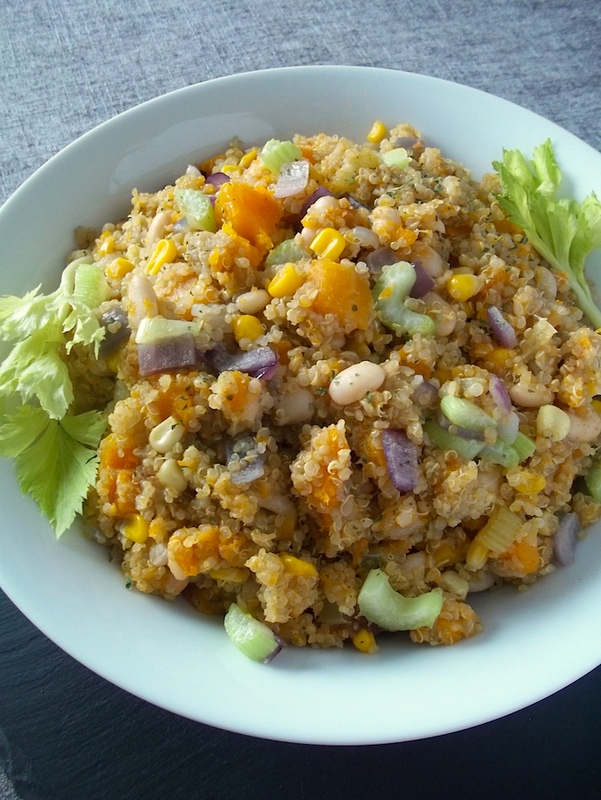 I love quinoa… Nice recipe! I’ve never had succotash before, but everything in it sounds delicious! I might have to give it a try. 😉 Thanks for sharing at Savoring Saturdays! Hope to see you back this weekend. Followed the recipe as instructed. So wheat do I do with squash? Recipe doesn’t mention when to add it. Oops, sorry about that omission. You can kind of see in the photo that the squash is added with the corn and celery and cooked with them for three hours.